Lincoln K2689-1H Easy Mig 180 Amp Mig Welder w KH605 Auto Darkening Helmet. 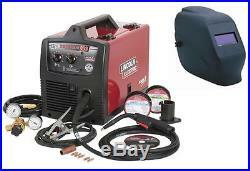 EasyMIG® 180 Welder Lincoln Electric K2698-1 Top Features. Heavy Duty Wire Drive – Fully adjustable drive system reduces the chance of wire tangling and crushing. Brass-to-brass gun connection enhances conductivity. Durable cast aluminum gear box delivers added drive torque and quiet operation. Capable Performance – Forgiving arc makes dialing in your application easy. Smooth arc starts with minimal spatter. 208/230/1/60 Processes: MIG, Flux-Cored Output Input. Equipment Details: 208/230 Volt AC Input Compact Wire Welder Get it done with the Easy-MIG® for farm, light fabrication, auto or home projects! If you have access to 208/230 volt input power, you can weld on thicker material. Simple two knob control makes it easy to tackle thin steel, stainless or aluminum sheet metal with MIG or thicker steel with flux-cored welding. Compare the precise drive, rugged construction and full list of standard accessories. Lincoln Electric Easy-MIG® 180 is an excellent choice! Heavy Duty Wire Drive. Fully adjustable drive system reduces the chance of wire tangling and crushing. Easy-turn numeric drive tension indicator identifies optimized ranges for different wire diameters. Forgiving arc makes dialing in your application easy. Wide 30-180 amp welding output range. MIG weld 24 gauge up to 3/16 in. (4.8 mm) sheet metal in a single pass. Weld up to 1/2 in. (12.7 mm) steel using self-shielded Lincoln Electric Innershield® (FCAW-S) wires. Cored Wire Size Range. Wire Feed Speed Range. 50-500 ipm (1.3-12.7 m/min). Dimensions (H x W x D). 14 in x 10.15 in x 18.6 in (357 mm x 258 mm x 472 mm). What’s Included: Gun. Magnum® 100L gun and 10 ft. (3.0 m) cable assembly with brass gun connection and 4-pin MS-Type connection for trigger control (K530-6). 025 in (0.6 mm) and. 035 in (0.9 mm) contact tips. Gasless nozzle for Innershield® welding (KH726). Gas nozzle for MIG welding (KH725). Spindle adapter for 8 in. (203 mm) diameter spools (KH720) Shielding Gas Apparatus. Harris® 3000290 Gas Regulator (S25805) and 52 in. (1.3 m) hose (S19303) for use with Ar/CO2 or CO2 gases. For use with CO2 shielding gas, order a Lincoln Electric S19298 CO2 shielding gas bottle adapter. (0.6 mm) diameter SuperArc® L-56® premium MIG wire. (0.9 mm) diameter Innershield® NR®-211-MP flux-cored wire Other. Work clamp and 10 ft. (3.0 m) cable. K2698-1H includes the KH605 ADF Helmet. Lincoln Electric KH605 ADF Helmet – Fixed Shade 11. New in original packaging. Tough and lightweight helmet with the convenience of an auto-darkening lens. 2″ x 4-1/2″ Lens. Darkens to shade 11. Comes with Ratchet headgear. Solar powered lens – always on and ready to use. No batteries to change. Please check out our other auctions. The item “Lincoln K2689-1H Easy Mig 180 Amp Mig Welder w KH605 Auto Darkening Helmet” is in sale since Thursday, December 21, 2017. This item is in the category “Business & Industrial\CNC, Metalworking & Manufacturing\Welding & Soldering Equipment\Welding\Welders, Cutters & Torches\MIG Welders”. The seller is “atli” and is located in Bowling Green, Missouri. This item can be shipped to United States. K2185-1H includes: K2185-1, KH605 The Lincoln Electric K2185-1 Handy MIG is a compact, portable and lightweight wire feed welder that plugs into a 115V, 20 amp outlet. Four voltage settings and continuous wire feed speed adjustment allow it to weld mild steel from 24 gauge to 1/8in. And, it’s easy to get started since practically everything you’ll need to MIG weld is in the box gun and cable assembly, work cable and clamp, gas nozzle, gas regulator and hose, spool of solid wire, contact tips and handshield with filter plate and lens. Just add a cylinder of shielding gas. Also included is a spool of self-shielded, flux-cored wire, contact tips, and chipping hammer/brush so you can use your Handy MIG to weld with gasless, flux-cored wire too. Welds up to 1/8 in. Plugs into household 115V, 20 amp outlet. Cold contactor safety feature keeps welding wire electrically cold until MIGgun trigger is pressed. Compact, portable, lightweight Continuous wire feed speed adjustment and selectable voltage ranges for precise control. Fan-cooled for long life expectancy. Physical specifications: Weight:46 lbs. Dimensions (in) H x W x D : 12.8 x 8.8 x 18 Dimensions (mm) H x W x D : 325 x 224 x 457 Processes: MIG, Flux-Cored. Welding gun and cable assembly Work cable with work clamp. Gas regulator and hose for MIG welding. Gasless nozzle for flux-cored welding. SuperArc L-56 solid mild steel MIG wire 1 lb. Innershield NR-211-MP flux-cored wire. Contact tips – quantity 3. Contact tips – quantity of 3 Welding handshield with #10 filter plate and clear glass cover plate. Lincoln Electric KH605 ADF Helmet – Fixed Shade 11. New in original packaging. Tough and lightweight helmet with the convenience of an auto-darkening lens. 2″ x 4-1/2″ Lens. Darkens to shade 11. Comes with Ratchet headgear. Solar powered lens – always on and ready to use. No batteries to change. Rated CV Output Amps/Volts/Duty Cycle. Wire Feed Speed Range (IPM). Wire Feed Speed Range (M/MIN). Solid Wire Size Range. Cored Wire Size Range. The item “Lincoln K2185-1H Handy MIG 110V MIG Welder with KH605 ADF helmet (NEW)” is in sale since Monday, April 03, 2017. This item is in the category “Business & Industrial\Manufacturing & Metalworking\Welding & Soldering\Welding\Welders, Cutters & Torches\MIG Welders”. The seller is “jsn2000″ and is located in West Union, Iowa. This item can be shipped to United States. 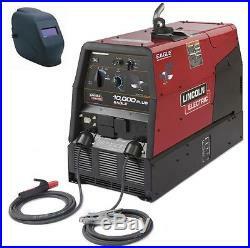 Lincoln K2343-3 Eagle 10,000 Plus Welder and Generator with Free auto-darkening Helmet. EAGLE 10,000 Plus. Make Work Fly with an Eagle 10,000 Plus! A great choice for getting the job done! For construction contractors, maintenance crews, farmers or ranchers, the Eagle 10,000 Plus does a variety of basic welding jobs. And with 10,500 watts of surge AC generator power, it handles a variety of other jobs: lights, grinder, Lincoln Electric inverter, plasma cutter (separate air supply needed) or emergency power. Processes Stick, TIG, MIG, Flux-Cored, Gouging Advantage Lincoln. 10,500 Watts Peak Single-Phase AC Generator Power – Most peak power in its class. Use peak power for motor starting. 9,000 watts continuous power for high capacity needs such as a back-up generator, powering a Pro-Cut plasma cutter, or an Invertec inverter welder. Also for lights, a grinder or other power tools. 23 HP Kohler Gasoline Engine – 2-cylinder, 4-cycle OHV (overhead valve) air-cooled. Weld with up to 5/32 (4.0 mm) electrodes. Rugged Reliability – To ensure reliable operation in a wide variety of environmental conditions. Engine is fully protected. 3 service access doors. Low Noise 76.4 dBA sound level at 23 ft. 100.7 dB sound power (Lwa) at rated output. Smooth DC welding output for a broad range of stick electrode types. MIG, Flux-Cored and basic TIG welding in constant current mode (with optional equipment). (1) Welding accessories included. 10,500 Watts Surge Single-Phase AC. Surge for motor starting. 9,000 watts continuous power for generator, plasma cutter or inverter welder. Lights, grinder, power tools. 23 HP Kohler Gasoline Engine. 2 cylinder, 4 cycle overhead valve air-cooled design. Oil drain extension for easy oil changes. 12 gallon tank for extended run times. Only 1.3 gallons/hour at 210 amps DC, 25V, 100% duty cycle. Visual fuel level gauge on both sides of unit. Welding and AC Generator Outputs Rated at 104F (40C). (1) A constant voltage (CV) power source is recommended for wire feeder applications. The across-the-arc Lincoln LN-Series wire feeders may be used with a constant current (CC) power source, such as the Eagle 10,000 Plus, for non-critical applications where weld quality and deposition properties are not critical. Dimensions (in) H x W x D : 29.9 x 21.5 x 42.3 Dimensions (mm) H x W x D : 759 x 546 x 1074. Base Unit Includes 20 ft. (6.0 m) of #2 electrode cable, electrode holder 15 ft. (4.5 m) of #2 work cable and work clamp INPUT OUTPUT Recommended General Options. View all General Options. Small Two-Wheel Road Trailer with Duo-Hitch. Fender and Light Kit. PTA-26V TIG Torch (25 ft 2pc). Precision TIG 225 Ready-Pak 208/230/1/60. Invertec V205-T AC/DC One-Pak Package 115/230/1/50/60. Recommended Wire Feeder Options. Recommended Plasma Cutter Options. Pro-Cut 55 w/25 ft Torch 208/230/460/1/3/60. Rated CC DC Output Amps/Volts/Duty Cycle. HP & Speed (rpm). Kohler OHV Command CH23S. 10500 watts surge 9000 watts continuous. The K2343-3H includes Lincoln Electric K2799-2 Auto Darkening Helmet Lincoln Dark Fire ADF Helmet – 9-13 Var The Lincoln Electric K2799-2 auto-darkening helmet features a variable shade 9-13 solar powered auto-darkening lens. Turn dial on the side of helmet to adjust the lens from shades 9-13. (6.0 m) of #2 electrode cable. (4.5 m) of #2 work cable and work clamp to get you started! Magnum PRO 100SG Spool Gun. Tomahawk 1000 Plasma Cutter with Hand Torch. The free listing tool. The item “Lincoln K2343-3H Eagle 10,000 Plus, Welder & Generator with Free ADF Helmet” is in sale since Friday, March 27, 2015. This item is in the category “Business & Industrial\Manufacturing & Metalworking\Welding & Soldering\Welding\Welders, Cutters & Torches\TIG Welders”. The seller is “jsn2000″ and is located in West Union, Iowa. This item can be shipped to United States.